In today’s episode we’re making a fun little project from more scrap wood lying around my shop, specifically we’re building a beard comb. 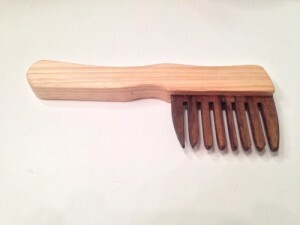 Why a beard comb? Given it’s the beginning of November, that means it’s also the beginning of “Movember.” So I thought it would be a fun little project for some of my full-bearded woodworking friends, and an unique way to draw attention to the Movember cause. The comb is very easy to make, only requiring a simple bridle joint and a little time shaping the handle to your hand. It’s a fun experiment in becoming more acquainted with hand tools such as spokeshaves and rasps and can even be made entirely with hand tools by cutting the curves with a coping or fret saw. But for mine, I’ll use a combination of power and hand tools to get it built. Is it cheating? I don’t think so, it’s just a lot of fun. So what exactly is Movember? It’s a yearly event to raise awareness about men’s health issues, specifically Prostate & Testicular cancers and mental health. According to the website www.movember.com “The Movember Foundation is the leading global organization committed to changing the face of men’s health. I don’t know about you, but that sounds like a good cause to me! So have some fun with the project and consider giving to raise awareness to these important health issues. If you end up making a beard comb, I’d love to see some pictures. Please share them either on the Matt’s Basement Workshop Facebook Page or by emailing them to me by clicking here. Do you have any species suggestions for the teeth? Or is this less functional and more decorative? Since this is my first attempt at making one I don’t have much insight into preferred species. I do suggest though to be careful with certain “exotics” as the natural oils they have may cause allergy issues. I’d say hardwoods are definitely a must. They might be less prone to breakage and splintering. Your video was very nicely done. A neat project and a very worthy cause. My father has prostrate cancer and fortunately they found it early and have been able to treat it. Keep up the good work.